Contact Information: Operations Feedback at OperationsFeedback@dot.gov. The Capital District Transportation Committee (CDTC) uses a broad and integrated approach for transportation planning in the Albany-Schenectady-Troy (New York) metropolitan area. This approach encompasses issues critical to the future of the Capital District, such as land use planning, development patterns, and general quality of life and economic development issues. These concerns are reflected in the agency's Congestion Management Process (CMP). While congestion is an important issue, the public views many other issues as more important to its quality of life. To reflect this perspective, the metropolitan transportation plan focuses transportation investments to encourage urban reinvestment, mixed use, transit-oriented development, and context sensitive design. Likewise, performance measures balance congestion mitigation with a wide range of other measures. Moreover, by linking the CMP and planning process—in terms of input, data, performance measures, and regional objectives—the CDTC is able to engage a variety of groups in the regional decisionmaking process. Thus, the CDTC is able to ensure that broader regional goals, and the greater public interest, are met. The Capital District Transportation Committee is the designated metropolitan planning organization (MPO) for the Albany-Schenectady- Troy metropolitan area. The region has four central cities and a unique development pattern with much of the suburban development located between the cities. Albany is the largest municipality in the region with 95,000 residents and a central business district with approximately 40,000 employees. Ten other cities and towns within the region have at least 20,000 residents and several employment centers of 3,000 to 15,000 employees. While CTDC was initially created with the responsibility to develop the region's metropolitan transportation plan, the agency's planning efforts have expanded to investigate broader issues critical to the future of the Capital District, such as land use planning, development patterns, and general quality of life and economic development issues. The CDTC's planning efforts are intended to be action-oriented, ensuring that the goals of the region's residents are incorporated into CDTC planning and programming. The most recent metropolitan transportation plan, the New Visions 2030 Regional Transportation Plan, approved in October 2007, reflects this innovative approach. A new Congestion Management Process (CMP) was prepared as part of the development of the New Visions plan, and is fully integrated in the metropolitan transportation planning process. The four counties of Albany, Rensselaer, Saratoga, and Schenectady. The eight cities within the counties, Albany, Schenectady, Troy, Saratoga Springs, Cohoes, Watervliet, Mechanicville and Rensselaer. New York State Department of Transportation (NYSDOT). Capital District Transportation Authority (CDTA). Capital District Regional Planning Commission (CDRPC). New York State Thruway Authority (NYSTA). The Federal Highway Administration (FHWA) and the Federal Transit Administration (FTA) serve as advisory members. Congestion Management Principles (from the metropolitan plan). Identification of Critical Congestion Corridors. Data Collection and Performance Monitoring. Congestion Management Planning, Programming and Project Implementation. Figure 1. 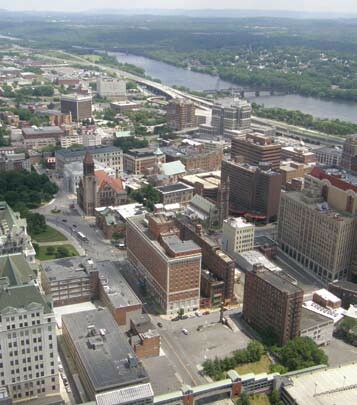 Aerial view of Albany, New York © Ritu Jethani – Fotolia.com. The CDTC recognizes that growing amounts of congestion are evident in the Capital District today but does not view current congestion as a major threat to economic vitality or to the overall quality of life for residents within the region. Congestion is generally confined to intersection delay, mid-block delay on certain two-lane suburban arterials, and erratic, but increasingly frequent breakdowns of freeway flow. While congestion is an important issue, surveys in the Capital District have indicated that the public views many other issues as more important to quality of life. For instance, the public strongly supports increased investment in transit, bicycle, and pedestrian infrastructure over highways, and cares about issues such as speed limit enforcement as much as congestion relief. A survey conducted as part of the CDTC Route 5 Corridor Study asked, "Would you be willing to accept traffic levels and congestion roughly as they are on Route 5 now if we could improve transit, walking, biking, landscaping, attractiveness and safety?" The respondents overwhelmingly (81%) answered "yes" to this question. Unreliability in travel times related to incidents, however, is viewed as the most important adverse effect of congestion. As a result, the New Visions plan focuses transportation investments to encourage urban reinvestment, mixed use, transit-oriented development, and context sensitive design. Performance measures are an important part of the New Visions plan; they were selected to consciously focus attention on meeting community goals. Consequently, congestion measures are one type of performance measure in the plan, but are balanced with a wide range of other measures, including access, safety, energy, environmental, and economic development-related measures. The CMP updates the Congestion Management System (CMS), which had been used in the region since 1995. The CDTC's update renews many of their previous approaches to congestion management, but also includes new performance measures and data sources, updates values for the New Visions performance measures, introduces new congestion management principles, and describes the integration of management and operations (M&O) into the CDTC planning process. In fact, the CDTC has discovered, through its extensive efforts in developing its New Visions regional transportation plan, that the flow of policy from the plan to the data collection process is as important as, perhaps more important than, the flow of information from the CMP to the plan. That is, the visions, goals, and objectives in the metropolitan transportation plan should influence the performance measures and data collection in the CMP as much as the CMP should influence the plan. This is why the CDTC ensures that all the regional objectives from the planning process are reflected in the CMP, not just those relating directly to congestion. Since the CDTC stresses that congestion is not necessarily the primary issue facing the region, all performance measures from the regional plan are included in the CMP. The CDTC views weighing trade-offs as critical to the CMP and planning process, and the agency wants to ensure that decisions are based on broader regional objectives and public input. The CMP includes two specific congestion goals to guide congestion management efforts and to help define success from the CMP: (1) Support growth in economic activity and maintain the quality of life in the Capital District by limiting the amount of "excess" delay encountered in the movement of people, goods and services; and (2) Make contributions to the avoidance and mitigation of congestion on all modes by implementing demand management programs before performing capacity enhancements. The CDTC has established congestion avoidance and mitigation principles in the New Visions plan used to guide the CDTC's selection of actions. The principles reflect the congestion goals of the CMP that were established through its visioning process. These principles focus on prioritizing travel demand management and operational improvements over highway capacity expansion. The principles also note that incident management is essential to effective congestion management to address "non-recurring" congestion and that any major highway expansion considered by the CDTC will include a management approach, such as high-occupancy vehicle (HOV) lanes. Moreover, other performance measures, such as pedestrian, bicycle and transit access, community quality of life, and safety will be considered along with congestion measures in project development and design. The CDTC uses excess delay as its primary measure of congestion. Recognizing that nearly all travel experiences some amount of delay relative to free-flow speeds, excess delay is defined as the amount of time spent at a given location or along a road segment that exceeds the maximum amount of time that is generally considered acceptable. Previously in the CMS, excess delay was measured using the CDTC's travel demand model, based on volumes and theoretical capacities. However, the working group recommended changes because of weaknesses in this approach, including the issue of theoretical highway capacities derived from the Highway Capacity Manual being routinely exceeded on many highways, drivers changing routes and time of travel to avoid congestion in ways that are not adequately addressed in the model, and the regional model not assessing the magnitude of incident-related delay. The CDTC recognized the importance of incident-based delay, since when congestion is predictable, it is generally considered to be more tolerable. However, when congestion is unpredictable, for example because of unpredictable incidents that have significant impact on travel time, the congestion can be more frustrating and disruptive to travelers. As a result, the CDTC supplemented its modeled data in the CMP with a new data set called MIST (Management Information System for Transportation), which provides speed and volume data on each lane of expressway segment every 15 minutes throughout the year. This data is collected by the New York State Department of Transportation (NYSDOT) for a number of locations on I-87 and I-90 as well as one location each on I-787 and Alternate Route 7. The CDTC uses a measure developed by the Texas Transportation Institute (TTI) called "planning time index," a ratio of driving time on one of the slowest traffic days to driving at 55 miles per hour. For instance, a planning time index of 1.5 means that a trip which takes one hour in free flow traffic would take one and a half hours on average once every 20 days during the peak period. So, if a traveler wanted a 95% change of arriving on time, he or she would have to plan to leave one half hour earlier than if there were no congestion. Using the MIST data, planning time indices are calculated on Capital District expressway segments for AM and PM peak periods. Maps are developed showing the locations with the largest reliability problems. Although measures of non-recurring delay are not modeled for 2030 given current limitations in travel demand modeling capabilities, CDTC considers these measures of current conditions valuable for identifying problem areas and prioritizing investments in the transportation planning process. The CDTC uses a comprehensive set of performance measures for the Congestion Management Process that is identical to the performance measures defined for the CDTC's New Visions. In terms of the transportation service, the selected core measures are identified in the table below. The CDTC considers access, accessibility, and system flexibility, in addition to congestion, given that these are important aspects to encouraging consideration of alternatives to single occupant vehicle (SOV) travel. Several other measures are used by the CDTC relating to resource requirements and external effects. For example, since safety and air quality can be improved with congestion management, the CDTC considers these in developing congestion management strategies. Land use performance measures are also in the CMP because land use is seen as an important tool for congestion management. A benefit of linking the CMP and planning process—in terms of input, data, performance measures, and regional objectives—is that CDTC is able to engage a variety of groups in the regional decisionmaking process. While the CDTC still has a formal transportation improvement program (TIP) process to analyze projects, the involvement of operators and other stakeholders in the CMP allows the agency to collect information earlier in the process to generate the scope of projects for further development. Additionally, since the CMP reflects all the goals of the plan, not just those relating specifically to congestion, the agency is able to ensure that broader regional goals are met. The CDTC has found data collection to be a critical element of success to achieve performance-based planning and facilitate CMP integration with the planning process. The CDTC, supported by the New York State Department of Transportation, has had extensive data collection practices in place in the Capital District for some time. The region has a number of continuous count locations in the area and has recently established a three-year coverage count process to maintain current traffic volume information on the Federal-aid system. Furthermore, many of the counties and municipalities conduct ongoing traffic volume studies of county and local roads. Once collected, that data is forwarded to the CDTC, which includes it in its comprehensive traffic count system. During an earlier CMS development, the CDTC completed a 3 year intersection analysis process, including collection of AM and PM peak period traffic counts, vehicle classification, and operational data for approximately 400 intersections. Additionally, the Capital District Transportation Authority (CDTA) implemented a full passenger count monitoring program that identifies ridership levels by route, location, and bus trip. Unfortunately, much of the data provided by partners is not collected in the frequency and consistency needed to fully support the CDTC's congestion management process. Additionally, the identified performance measures require collection of some data that is not currently available, including continuous intersection counts, routine vehicle occupancy counts, and regular household travel surveys among other items. The CDTC has also identified improvements in the transfer of transit data to the formal CMP database as something to address as it advances its CMP. Funding for the Capital District Transportation Management Center (TMC) is a major commitment in CDTC's TIP. The TMC is a source of extensive data on traffic volumes, speeds, and incidents that are necessary for the CMP. In addition, emerging technologies hold promise for even more extensive data collection through the TMC, such as the TRANSMIT system, which can monitor speeds of vehicles on different segments of the expressway system. The system is in place, but further work is still needed to collect data for planning purposes. FHWA/FTA Webinar, Christopher R. O'Neill, Capital District Transportation Committee, June 24, 2008. Capital District Transportation Committee, The Metropolitan Congestion Management Process, May 29, 2007. http://www.cdtcmpo.org/rtp2030/materials/cm-doc.pdf.